Every month a three friends come to Linderhof for lunch. We've finally settled on the first Tuesday of the month. We've been doing it for ten years and I thoroughly enjoy the luncheons. These ladies are "foodies" and food is the topic. I get to try new recipes and I've yet to send out for pizza. I called this a paperwhite luncheon as paperwhites were the centerpiece and my four bird "vases" each held a spray of paperwhites. 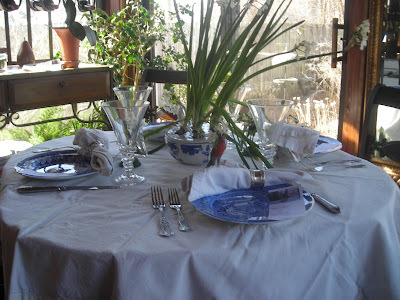 The plates are some of my Spode blue room and I used my white overlay tablecloth and white napkins as well. The cutlery is stainless -- English hotel is the pattern -- they don't match which suits me fine! The glasses are actually parfait glasses that we got at a restaurant/bar show in Las Vegas. They truly have been workhorses. At each place is a menu -- a souvenier as well as knowing what the next course will be! The silver napkin rings are part of my extended collection of Victorian and Edwardian napkin rings. ALL have either names or initials and are used daily. Gathering four birds took four years -- the first came from Nell Hill's in Atchison. The second bought a couple of years later came from a garden shop. Both were what I considered pricey! The last two were bought on my birthday in a gift shop in a little town about an hour north. They were on sale for half price! Finally, I had my four! It was a taste of spring in a rather cold Febreuary day. A simple tabletop but a welcoming one. Looks like a lovely luncheon setting! Love the paperwhites and those birds are great!! Blue and white is always so pretty! Beautiful table! Everything looks so lovely! Actually, the Linderhof of the prairie is named after that Schloss Linderhof. We're about 3 hours south of Atchison. Am more excited by Nell Hills in KC -- I can get there in half the time. And yes, Mary Carol is a delightful person. Blue dishes, one of my favorites. Love the little birds. Gorgeous. I am so fond of birds, too. I love Nell Hills. My daughter's wedding china is Mary Carols black and white china. It is lovely, too! 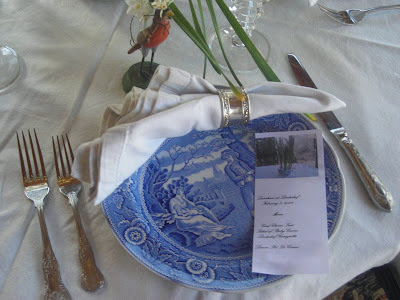 Martha I of course love the blue transferware! I also love the classic paper whites. Nothing is so peaceful as a paper white in the dead of winter. Lovely lovely table! Beautiful table Martha! I love setting tables and using all the goodies! Do you go to Nell Hill's often? It's several hours from us, but I love to go every other year or so. I like the Atchison store better than the KC store. Both are wonderful, but the little store is my favorite. First let me say... your home... photo in your header is FABULOUS! Perfect for painting! Now... your luncheon... lovely setting! I'm sure it smells heavenly... ADORE paperwhites! I love this. I decorated a table blue and white(http://beauxmondesdesignsevents.blogspot.com/2008/09/blue-white-asian-toile-garden-theme.html) in my backyard last summer similar to this but not as beautiful as yours. Blue & White dishes with crisp white linen and silver is probably my favorite setting. It just looks so elegant and inviting. Great job. Love everything about your tablescape. I'm jealous of your napkin rings. I need to find some. Pat -- I try to go as often as I can -- yes, the Atchison store is my favorite but . . . if I need a Nell Hill's fix the KC store is just a little over 1 1/2 hours away -- the Atchison store closer to 2 1/2! Love the menu idea & I love those birds! 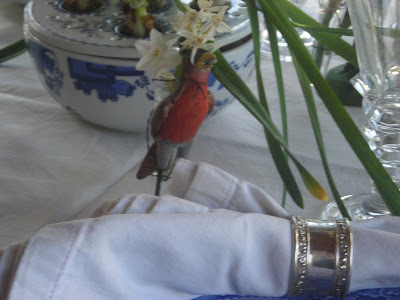 Your table really is very pretty, I am drooling over your napkin rings :). Kathy. BDM -- Your blue and white garden party looks lovely. After visiting your blog, I'm blushing from your compliments! Beautiful table! Love your birds and the blue and white plates are so pretty. I have always loved the smell of paper whites! What a great outdoor lunch tablescape. I just adore the Spode. Love the birds, everything looks lovely. What a LOVE-ly tradition...getting together for a lunch every month! Your table is beautiful...love the paperwhites theme. 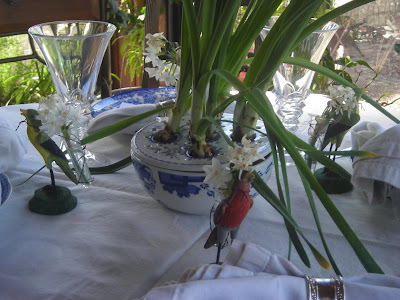 I love the bird vases with the paperwhites. Mmmm.... Spode. You don't need anything else! Lovely table, charming setting. I have one silver napkin ring; it was mine as a baby and has tooth marks in it. My mom thought it a good teething ring! What a lovely and beckoning table! Love the Paperwhites and your Blue Spode. What a great tradition! Have a good rest of your week! I am new to blogs and only follow one so far but the name Linderhof caught my attentuion since we have been there several times many years ago. I am a blue-white fan myself and lucky enough to have a husband who collects Spode.It is the Tower pattern and we have many many pieces.